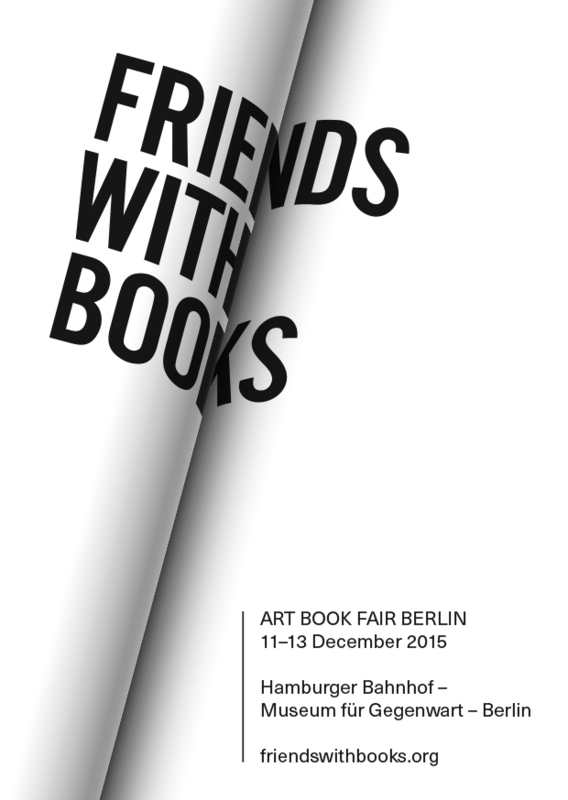 The Friends with Books Art Book Fair Berlin opens this Saturday, December 12th, with an opening reception on Friday the 11th. Details and program schedule below. 13:00 h Dr. Michael Lailach, Kunstbibliothek Berlin, leads a panel discussion with artists Céline Duval, Joachim Schmid, Erik Steinbrecher, and Elisabeth Tonnard on the artist and author as publisher. Strategies of text and image collection, of arrangement and publishing are to be discussed. Presented by Friends with Books. 14:00 h Hamburger Bahnhof Curator, Lisa Marei Schmidt, and Education and Outreach Curator, Daniela Bystron in conversation on the current exhibition, A-Z. The Marzona Collection. Presented by Friends with Books in partnership with Hamburger Bahnhof – Museum für Gegenwart – Berlin. 15:00 h Gundi Feyrer reads extracts and shows pictures about/from Dieter Roth, Tomas Schmit, Karin Hochstatter, Haegue Yang, Nanne Meyer, Elfriede Jelinek from her new book 27 Dicke Bilder Und Fliegende Saetze: Miniature Portraits in Clay, Wire, Wood, Acrylic, Paint and Word (Edition Patrick Frey, 2015). Presented by Edition Patrick Frey. Programme in German. 16:00 h Ingrid Chu, Public Programmes Curator of Asia Art Archive (AAA), speaks with the collective Slavs and Tatars on their residency and exhibition as part of the Archive’s new Free Parking programme series featuring 'art libraries from elsewhere' in conversation with the AAA collection in Hong Kong. Presented by Friends with Books. 17:00 h Dominique Hurth’s séance de lecture investigates the physical manifestation and the performativity of a book. Looking subjectively at the never-realised project of French poet Stéphane Mallarmé’s Le Livre (The Book), this work explores the relationship between text and word, speech and act, the materiality of writing and reading, as well as the expansion of pages once manipulated, re-read and spoken. It operates as a partial reconstruction of Mallarmé’s project, based on Hurth’s thorough research of his manuscript. This work has been generously supported by FNAGP (Paris). Presented by Friends with Books. 18:00 h A tableau vivant performance, Gradients-Gradients, with limited editions from Black Palm, exploring con­tem­po­rary col­lec­tive expe­ri­ence and the standardisation of cultural goods. Presented by Black Palm. 13:00 h Susanne von Falkenhausen and Dominikus Müller, editor of frieze d/e, in conversation about “Network Painting” and the question of representation. On the occasion of von Falkenhausen's conversation with critic David Joselit in the current issue of frieze d/e, Müller and von Falkenhausen speak about differences and commonalities between art history and visual cultural studies–the subject of von Falkenhausen's new book Jenseits des Spiegels. Das Sehen in Kunstgeschichte und Visual Studies (Wilhelm Fink Verlag, 2015). Presented by frieze d/e. Programme in German. 14:00 h Artist Willem de Rooij and Defne Ayas, Director, Witte de With, discuss de Rooij’s latest publication Character Is Fate: Piet Mondrian’s Horoscope (Witte de With Publishers, 2015) and his respective year-long presentation at Witte de With, which take as their focus the historical and unique documents of Piet Mondrian’s horoscope. Presented by Witte de With Publishers. 15:00 h/16:00 h Join e-flux journal for a series of presentations and performances by Julieta Aranda, Susanne Von Falkenhausen, Ana Teixeira Pinto, Matteo Pasquinelli, and Anton Vidokle. “Having no body and no name is a small price to pay for being wild, for being free to move across (some) countries, (some) political boundaries, (some) historical ideologies, and (some) economies. I am the supercommunity, and you are only starting to recognize me. I grew out of something that used to be humanity. Some have compared me to angry crowds in public squares; others compare me to wind and atmosphere, or to software. Some say they have seen me moving through itinerant artists and curators, through refugees and migrant laborers, and through the lost cargo ship that left a trail of rubber ducks that will wash up on the shores of the planet over the next 200 years. I convert care to cruelty, and cruelty back to care. I convert political desires to economic flows and data, and then I convert them back again. I convert revolutions to revelations. I don’t want security, I’m not worried about famine, drought, wifi dead zones, or historical grievances, because I already stretch across the living and the dead. I can be brutal if that is what’s needed. Historical pain is my criteria for deciding the pricing of goods and services. Payback time is my favorite international holiday, when things get boozy and a little bloody. Economies have tried to tap into me. Social contracts try to teach me to behave, but I don’t want rights. I want fuel. And if you think you can know me, I’ll give you such a strong dose of political and economic instability that you’ll wish you never tried. The editors of e-flux journal have tried to trace my footsteps by asking artists and thinkers to consider how the supercommunity assembles through a growing series of themes that reflect the profoundly contradictory scales of thinking that are currently altering the collective consciousness of contemporary art, and by publishing these essays, statements, and prognoses as individual installments over the course of the 56th Venice Biennale.” Presented by e-flux journal.